We meet the recruits as they prepare for boot camp, as their undignified haircuts signify uniformity and a removal of individuality and normal. If only we knew how much further they would go to reinforce this fact. 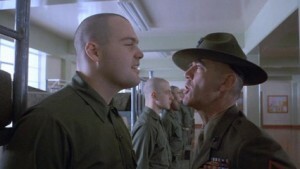 The undisputed leader of this new class is Gunnery Sergeant Hartman (R. Lee Ermey), a short statured bull of a man whose version of a whisper is a dull roar, and whose definition of subtle might be a kick to the groin. He spends several eardrum pounding minutes informing the knock kneed men that everything they thought about soldiering – regardless of what that might have been – was wrong, and that they better get used to high decibel, high intensity abuse. It’s an amazing scene made even more amazing when you realise that these young men are set to spend eight weeks with this unbelievably abrasive man. In another gesture of how ‘your former life’ doesn’t matter in the army, Hartman selects men at random to degrade with disgusting personal insults and all manner of put downs, often giving them nicknames on the spot. From this are ‘born’ the two figures among the faceless that the film will follow for now, Private Joker (Matthew Modine) and Private Pile (Vincent D’Onofrio). Joker is a good soldier but a loudmouth and smart-arse, Pile is the opposite, a born non-soldier with all the tools to guarantee the attention and anger of Hartman. I cringed each time Pile did something entirely human but clumsy, ignorant or plain absent minded, knowing full well Hartman would come down on him like an abusive tornado or denigration. And he did… often. The relationship of mutual disgust is the core of the best moments in the film as Hartman does his job all too well, that being the progressive breakdown of any sense of individuality and free thought that Pile previously enjoyed – in an albeit limited capacity. Eventually Hartman assigns Joker to be Pile’s personal aide and responsibility, much to the chagrin of Joker and other soldiers who similarly empathise with and despise Pile. Yet despite Pile being the whipping boy, all soldiers are treated equally; that is inferior to graduates of the bootcamp and therefore ‘real’ soldiers. Real men worthy of respect. In a barrage of scenes that reinforce my gut feel that I was not cut out to be a soldier, the army uses repetition, volume and discipline to erode free will, essentially breaking down the men so that they can rebuild them as unthinking, unfeeling soldiers out of the newly toned flesh. If Full Metal Jacket had faded to black after the scene in the training camp latrines and ‘Directed by Stanley Kubrick’ popped up, I would forever be blown away by this film. Sure it would have been about 50-something minutes long, but there aren’t many fifty-something minute spans nearly as compelling. 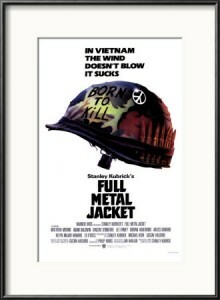 Unfortunately Kubrick then topped his movie off with another hour of stock standard Vietnam war movie stuff. Realistic, depressing and full of messages, but done before. And done before better. I appreciate the realism, and the fact that the film didn’t centre on one pivotal battle or single act of heroism, preferring instead to show the monotony, constant dread and the drain of emotion that being in an armed conflict surely provides. Full Metal Jacket is in essence about how men deal with pressure, not about defeating bad guys or vicious enemy Colonels. Some men take to the challenge all too willingly, some shut down the part of their brain that allows emotion, others still just get by. Final Rating – 8 / 10. This film provides perhaps the best explanation as to why these men arrive at whichever method of dealing with pressure that they opt for, it’s just a shame that after such a powerful first half that the film settled for being just a ‘very good’ film, instead of the all time classic that threatened.